VZ Enhanced 56K is a caller ID notifier that can block phone calls through the use of a 56K modem. It can block incoming calls based on individual phone numbers, ranges of phone numbers, and even caller ID names. Incoming calls will appear in the Call Log and will be displayed in a specific color depending on any action that was taken against them. Normal calls will appear with black text, and ignored calls will appear with red text. When you have an incoming call, you can right click the entry in the Call Log and choose to ignore the incoming call. If you ignore the call, then you will be disconnected from the caller and your phone will stop ringing. Of course you don't have to manually do any of this. 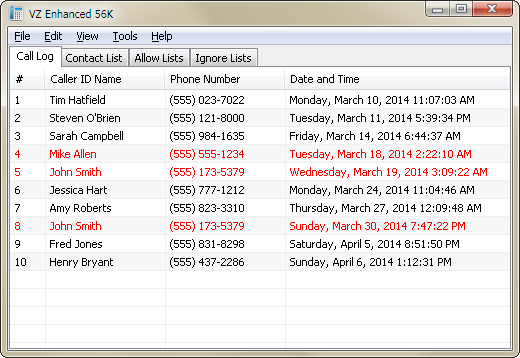 VZ Enhanced 56K has two supplementary lists that can automate the process of ignoring incoming calls. This is a great way to fight back against annoying telemarketers. Select the Ignore Lists tab from the main window to access these features. Right click a list to add an entry. The ignore phone number list will prompt you for a phone number to automatically ignore whenever that number calls. You can ignore an incoming phone number based on the caller ID name as well. Select the ignore caller ID name list to add entries. If you would like to ignore a range of phone numbers (up to 15 digits), you can specify a wildcard value '*' in replace of a digit. For example, suppose you want to ignore a 10-digit phone number with an area code of 555. In the ignore text box you would type the following: 555******* This represents a range from (555) 000-0000 to (555) 999-9999. In total, 10 million numbers will be blocked by using this example. Pretty cool, huh? Now here's something even cooler. The following four entries will block all invalid 10-digit US phone numbers. These particular phone numbers are guaranteed to be fake and can be outright ignored without consequence. These four entries will block 3.6 billion potential telemarketers. It should be noted that the phone number lists have precedence over the caller ID name lists. VZ Enhanced 56K has various options to configure the behavior of the program. The options can be accessed from Tools > Options... The first tab that appears is the General tab. In it you can choose to display the System Tray icon which will generally appear on the lower right corner of the taskbar (next to the clock). The program can be set to minimum to the System Tray instead of to the taskbar and close to the System Tray instead of exiting the program. The Silent startup option causes the program to be hidden in the System Tray when it's loaded. This way you don't have to hide or minimize the program while it logs in. Always on top will cause all the program's windows to appear on top of every other program's windows. Enable Call Log history will save the entries in the Call Log so that they can be loaded the next time the program starts. If left unchecked, then any Call Log history will be lost. Finally, the Log events to Message Log will log various events such as connection attempts and list modifications to the Message Log. You can access the Message Log by clicking the View > Message Log menu. The Connection tab handles connection related settings. Reconnect upon connection loss determine how many reconnect attempts are made to establish a connection. You may want to set this to a large value if you're on a flaky wireless connection. The Timeout setting determines how long (in seconds) a connection will attempt to connect before it fails. As with the reconnection attempts, you may want to set this to a large value if you're on a flaky wireless connection. The SSL / TLS version is used to change the encryption protocol version. It should be left as TLS 1.0. Finally, you can Check for updates upon startup to see if there's any updates for VZ Enhanced 56K. The Modem tab handles modem related settings. If a modem is found on the system, it'll be listed in the Default modem dropdown list. If the modem supports voice communication, then you'll be able to select Play recording when call is answered. To allow the program to load recording files, create a folder called recordings in the same directory as VZ_Enhanced_56K.exe. Recordings should be 8 bit or 16 bit .wav files with a frequency of 8000 Hz. The recording can be repeated up to 10 times, although you should keep the total length (including repeats) to 30 seconds or less. Finally, the Drop answered calls settings will drop the answered call after the selected amount of seconds. It is recommended to keep this set to 4 or more seconds so that the call has time to drop properly after it's been answered. The Popup tab will allow you to Enable popup windows and configure their appearance. You can change the popup's width, height, position, transparency, how long it's displayed for, whether it has a border, displays a contact picture, and if it should have a ringtone played. To allow the program to load ringtone files, create a folder called ringtones in the same directory as VZ_Enhanced_56K.exe, and copy to it any .wav, .mp3, or .mid audio file. Per-contact ringtones can be set when adding or editing contacts in the Contact List. The other popup options allow you to change the order of the text that's displayed, their font attributes and the popup window's background color. You can preview the popup by clicking the Preview Popup button. The browser extensions above will allow your browser (Firefox or Chrome) to send HTTP Downloader URLs to download. You will need to enable the web server in the HTTP Downloader Connection options. The server address and port in the extension's options need to match those in the program's options. You can choose to have the extension download HTTP(S) URLs instead of the browser by selecting Override browser's download manager in the extension's options. Right clicking on a link, web page, or media file will allow you to access the HTTP Downloader context menu and various download options. HTTP Proxy is an HTTP(S) proxy that can relay HTTP(S) traffic. See all the traffic that goes through your web browsers or any other HTTP(S) based program. Uses high performance input/output completion ports (IOCP) to handle multiple connections. HTTP Proxy is a command-line executable. The command-line prompts should be fairly easy to follow. If you saved a configuration file, you can load it to bypass all the configuration settings. Otherwise, you can save a configuration file after setting your preferred settings. If you choose to Enable SSL / TLS, then the security certificate files that you select must be in the form of either a PKCS #12 file, or a public and private key pair. If the PKCS #12 file has a password associated with it, then you'll want to enter its password. Creating a security certificate is somewhat involved, but there are plenty of guides online. Do a Google search for "Create a self-signed certificate with OpenSSL" and it should explain things better than I could. Ctrl + f - Starts the server. Ctrl + r - Restarts the server. Ctrl + e - Shuts down the server. Ctrl + q - Shuts down the server and quits the program. Ctrl + i - Displays the server's current settings. Ctrl + o - Toggles output information. When "ON", the program will display the connections it makes. 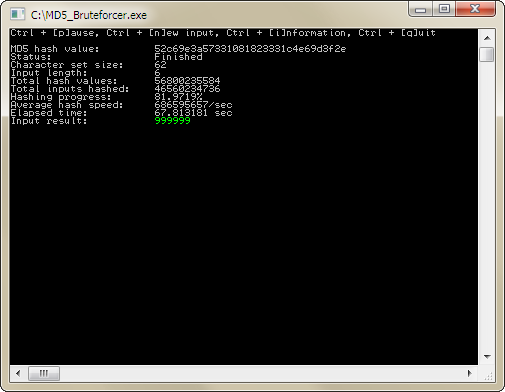 MD5 Bruteforcer is a CUDA based MD5 bruteforcer. Brute force millions of MD5 hash values per second with optimized MD5 algorithms. MD5 Bruteforcer is a command-line executable and requires a CUDA based graphics card with a Streaming Multiprocessor version of 13 (sm_13). The command-line prompts should be fairly easy to follow. Supply the program with an MD5 hash value, the presumed length of the hash's input, a character set to use when generating inputs, whether or not to randomize the character set, and GPU temperature constraints. Monitor Off will turn off the computer's monitor. A simple system tray program that lets you turn the monitor off with a mouse click or keyboard shortcut. Monitor Off resides in the System Tray and you can turn the monitor off by middle clicking (pressing the mouse wheel) its icon, or by pressing Ctrl + Shift + F4. Filter out domains that appear in the Google Search results. This is a WebExtension for the Firefox web browser. Google Search Results Filter will display a Hide or Show link next to the domain name of a search result. The domain name of a filtered search results will appear red. If any of the search results get filtered, then a Show Filtered Results link will appear at the bottom of the page. A full list of active filters can be found in the extension's options. Thumbcache Viewer - Extract thumbnail images from the thumbcache_*.db and iconcache_*.db database files found on Windows Vista, Windows 7, Windows 8, Windows 8.1, and Windows 10. Thumbs Viewer - Extract thumbnail images from the Thumbs.db, ehthumbs.db, ehthumbs_vista.db, Image.db, Video.db, TVThumb.db, and musicThumbs.db database files found on various Windows operating systems. VZ Enhanced - A caller ID notifier that can forward and block phone calls. It is a lightweight, feature-rich version of Time Warner Cable's VoiceZone™ Connect.